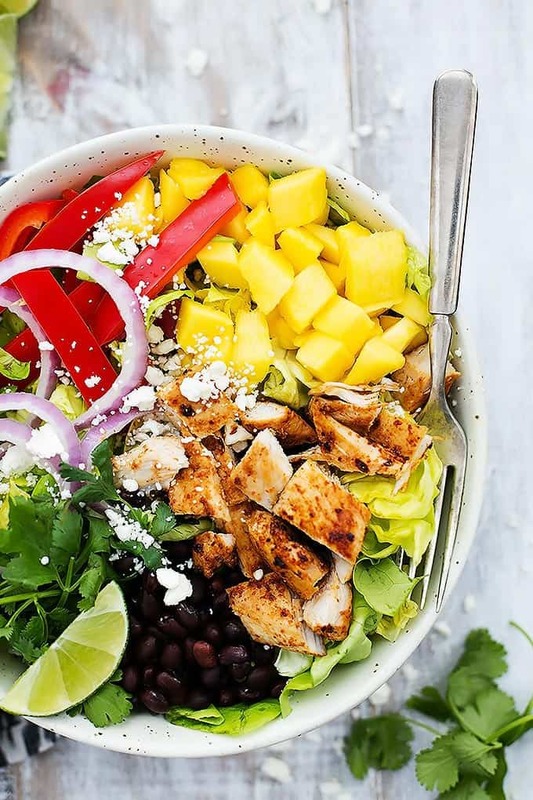 This Mango Chipotle Chicken Salad is full of fresh ingredients, topped with fresh mangoes, red onions and cilantro will leave your taste buds screaming for more! Salads are my jammmmm you guys. I seriously can’t live without salads. I go through withdrawals. And yes, that makes me sound like an addict but if the shoe fits…. Hi my name is Tiffany and I’m a salad-holic. The other cause of my late salad-bloomer-ness is that I don’t think I ever had a good salad until I was almost an adult. And by “good salad” I mean something other than a bag of iceberg blend topped with bottled ranch, cherry tomatoes, and croutons. You know my thirteen year old self just dipped those croutons in the ranch and called it done. 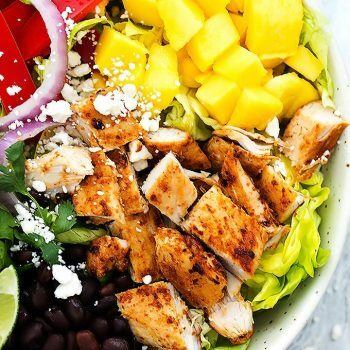 This right here, this mango and chipotle chicken thing we’ve got going on, this is a good salad. A stellar salad. It’s a variation on the basic salad I make on a regular basis at our house. Oh but something to note – I had a momentary brain thing and forgot to actually put the “dressing” on when I was taking these pictures. 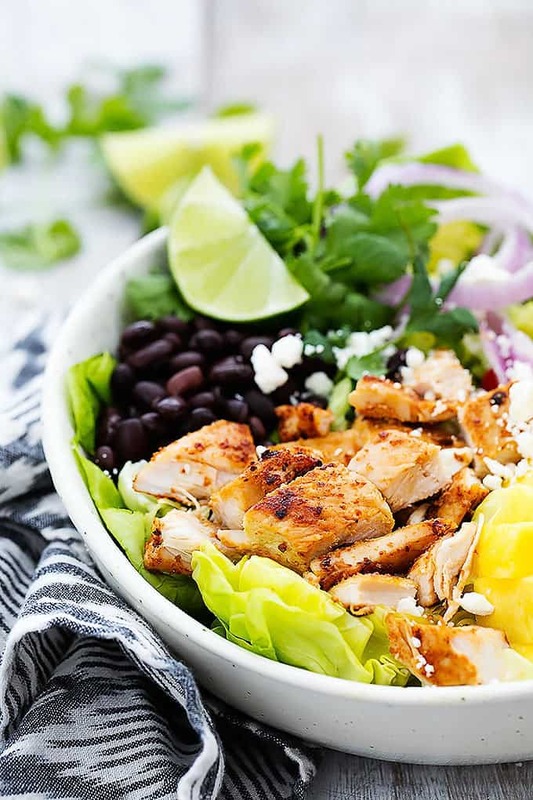 So just go with me on this and imagine that I have drizzled bbq sauce and/or green goddess dressing all over the top of this gorgeous salad. Okaygood, thanks! Slice chicken in half lengthwise. In a small bowl whisk together oil, chopped chipotle pepper, lime juice, salt, and garlic. Add sauce and chicken to a resealable bag, seal, and chill for 15 minutes. Remove chicken from bag and discard the bag with remaining marinade. Cook chicken in a large skillet over medium heat for 4-5 minutes on each side or until no longer pink in the middle. Dice chicken and set aside. 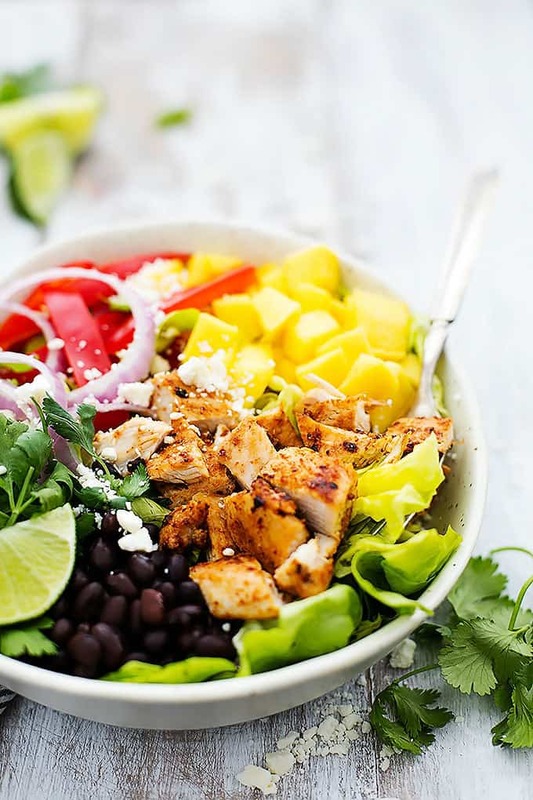 Assemble salad by topping lettuce with onions, peppers, mangoes, black beans, and cheese. Drizzle with bbq sauce and serve with lime wedges for serving. Top with cilantro and serve. For the dressing, I tried this with both bbq sauce and a store-bought green goddess dressing and both were amazing! Either way you can't go wrong. This salad is gorgoues! Seriosuly full of all of my favortie ingredeints and flavors! Is it possible to use Chipotle Chile powder in place of the pepper? If so, do you have a guess as to how much to use?